The governor's proposed law would allow certain multifamily housing projects in California's urban areas to go forward "by right," without requiring individual approval. Photo courtesy of Christopher Ulrich for SPUR. In May, Governor Jerry Brown proposed streamlining the approvals process for multi-family housing developments that are built in urbanized areas and include affordable housing. If passed, this proposal would mean that eligible housing proposals across the state would be approved “by right,” meaning they would not be subject to case-by-case local approvals or review under the California Environmental Quality Act. There are many causes of the Bay Area’s current housing crisis, but unfortunately chief among them is that, over the last few decades, our local land-use system has made it extremely difficult to add new housing. Proposals to build housing are met with years of delay and, often, outright disapproval. We believe the governor’s proposal can help. SPUR has been a long-time advocate for making housing allowable by right. 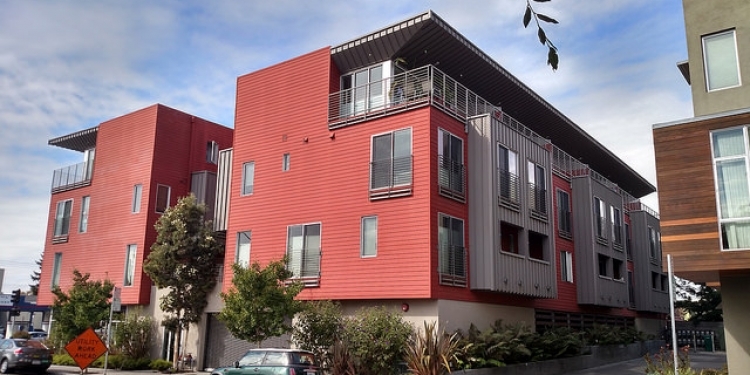 In our report 8 Ways to Make San Francisco More Affordable, we suggest increasing supply by allowing all housing projects that are compliant with local zoning to go forward without requiring case-by-case approval. How would the proposed by-right process work? For eligible projects, cities and counties would not be allowed to require special permitting, which extends timelines and creates uncertainty. Local jurisdictions would be held to limited timelines for approval and design review. Detailed project-level review under the California Environmental Quality Act, which lengthens the approvals process and creates opportunities that opponents can exploit, would not apply. By limiting local discretion on mixed-income infill housing proposals that are compliant with existing zoning, this proposal could speed up the delivery of housing and cut the cost of development, making it feasible to provide projects with lower home prices and lower rents. Under the governor’s proposal, cities would still have great control over land use. They would still develop their own zoning rules. But the zoning codes would actually matter: There would be a predictable, transparent rule of law, rather than today’s arbitrary and unpredictable system in which even projects that conform to zoning rules are routinely rejected. Under this proposal, there would still be significant process for public input and decision-making by elected officials; the process would simply take place when cities develop their general plans, area plans and zoning, rather than on a case-by-case basis. SPUR’s agenda for housing is to make it affordable to live here. Long-time community members, low- and middle-income families, artists, activists and others are finding it difficult to remain in their communities as competition for the limited housing stock increases. A healthy housing market should provide many options along the income spectrum. That includes affordable housing — especially for the formerly homeless and others with special needs who are not served by the market. But the open housing market has a role to play for the vast majority of us who will not win the affordable housing lottery. Our communities will never have enough money to subsidize housing for everyone who struggles to find a place they can afford. Unfortunately, our cities are not creating enough housing for the number of people who want to live here. Truly addressing the affordability crisis means investing in housing subsidies while at the same time building more supply. It’s possible that this proposal wouldn’t work. We should support it anyway. If it passes, cities will have to approve housing developments that fit within their zoning. Opponents of new housing will still be able to undermine proposals by pushing for overly expansive historic districts, affordable housing requirements that make construction infeasible or zoning that directly limits the amount of housing allowed. But it’s still a step in the right direction. This law would add integrity to the process and push our communities to make decisions through a planning process rather than through project-by-project fights. In tandem with funding for permanent affordable housing, increasing the overall housing supply is part of the solution to the Bay Area and California’s affordability issues. The governor’s proposal is not a panacea, but it is a practical, modest step in the right direction.